This article emphasized the safety issues surrounding toddler high chairs. Each year, thousands of children are treated in hospital emergency rooms for injuries associated with high chairs. Deaths also occur. The majority of the injuries result from falls when restraining straps are not used and when children are not closely supervised. The majority of deaths occurred when children slipped down under the tray and strangled. Most often, these children were either unrestrained or were restrained only by a waist belt. To help prevent injuries and deaths, toddler high chairs should have a waist strap and a strap that runs between the legs. While in the high chair, children should ALWAYS be restrained by both straps. The tray should not be used as a restraining device in place of the straps. Without these two straps, children can stand in the chair seat and topple from the high chair, or slide under the tray and strangle on the waist strap or when their heads become trapped between the tray and the chair seat. Other accidents occur when the chair tips over. Toddler high chairs may tip if an active child pushes off from a table or wall, stands up in the high chair, or rocks it back and forth. 1. Select one that has a wide base for stability. 2. Examine the restraining straps to ensure that the waist belt has a buckle that cannot be fastened unless the crotch strap is also used. 3. Since the restraining straps must be used every time a child is placed in the chair, look for straps that are easy to use. If the straps are difficult to fasten, you might not use them. 4. Consider toddler high chairs that has a post between the child’s legs to prevent the child from slipping down and becoming trapped under the tray. 1. Check the condition of straps and their attachments to make sure they are securely attached and work properly. 2. If the high chair does not have adequate safety straps, contact the manufacturer for replacement. 1. ALWAYS USE ALL RESTRAINING STRAPS PROVIDED. The crotch strap and belt around the waist should be fastened as soon as a child is placed in the chair and unfastened only when the child is removed. Remember, the feeding tray is not a restraint. Only safety straps keep the child from climbing out or sliding down and strangling. 2. Be sure that the locking device on a folding high chair is locked each time you set up the chair. 3. Never allow a child to stand up in a high chair. 4. Don’t stray too far from the high chair especially if the child has shown an ability to unfasten safety straps. 5. Keep the high chair far enough away from a table, counter, wall, or other surface so that a child can’t use them to push off. 6. Don’t let children play around a high chair or climb into it unassisted. 7. Don’t let older children hang on to a high chair while a baby is in it. The high chair could tip over. ** There is a "crotch" strap that must be used when restraining a child in a high chair. 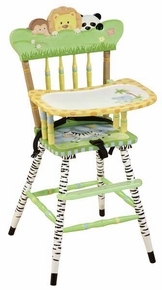 ** High chair has restraining straps that are independent of the tray. ** Buckles on straps are easy to fasten and unfasten. ** High chair has a wide base for stability. ** Caps or plugs on tubing are firmly attached and cannot be pulled off and choke a child. ** Folding high chair has effective locking device. The above article is extracted from Product Safety Commission, Washington, D.C. at www.cpsc.gov.